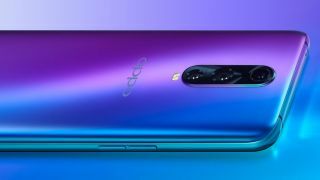 Chinese smartphone manufacturer Oppo is at it again, with a second patent filing for a handset with a pop-up display finding its way onto the web. While the previous patent detailed a modest additional screen, the new patent goes much further with what appears to be sizable pop-up and slide-out second display designs. As foldable phones such as the Huawei Mate X and Samsung Galaxy Fold kick off a new era of smartphone design, offering users a much larger screen, these Oppo patents feel like handsets which may bring a more affordable, big screen experience to the market. According to LetsGoDigital, the patent offers up two different potential designs, with the first packing a pop-up top section - like the rising cameras on the Find X, but bigger - housing an additional display. There is a slender bezel at the top of the main display, housing the selfie camera and earpiece speaker, and the second screen could provide additional controls when watching a video or playing a game, or even provide a multi-app experience. Then there's a design with a second screen which slides out from the side of the handset. Again this could be use to provide additional controls or app multi-tasking without having to minimize the app on the main display. As with all patents, there's no guarantee either design will ever make it to a commercially available handset, but the fact companies are exploring more elaborate smartphone designs is a reason for you to get excited about future releases.